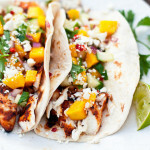 WE LOVE TO COOK, GRILL AND BARBEQUE! One of the nice things about Sea Bass is that it’s so moist that it can be easily grilled without drying out. Preheat the grill to around medium. Slice each mango in half. Remove the seed and skin with a spoon or peeler. Salt and pepper both sides and place on the hot grill until it is lightly charred, about 2 minutes. Flip for another 2 minutes. Pull and set aside to cool. Combine red peppers, scallions, jalapeños, Hot Fish Bait seasoning and olive oil in a large bowl. Dice cooled mango slices and add to the bowl. Add the lime juice, cilantro and a pinch of salt and pepper. Toss to mix. Set aside. Brush fish on both sides with olive oil and season with Fish Bait (a light layer on both sides) Grill fish about 5 minutes per side or until done. 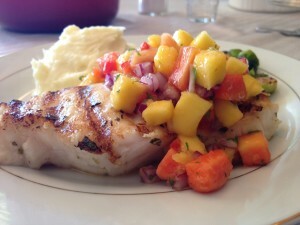 Plate fish and garnish with the mango salsa! Enjoy! The name “Chilean Sea bass” was invented by a fish wholesaler named Lee Lantz in 1977. He was looking for a name that would make it attractive to the American market. He considered “Pacific sea bass” and “South American sea bass” before settling on “Chilean sea bass”.In 1994, the U.S. Food and Drug Administration (FDA) accepted “Chilean Sea bass” as an “alternative market name” for Patagonian toothfish and in 2013 for Antarctic toothfish. 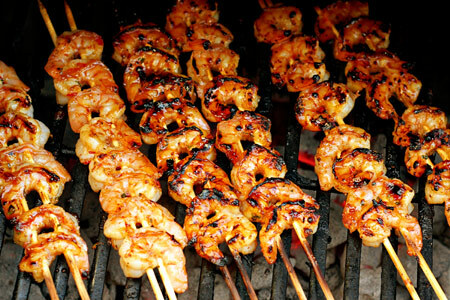 Place 5 shrimps on a skewer, coat both sides with Olive Oil and sprinkle both sides with Hot Fish Bait seasoning. Place on a hot grill for about 2 minutes per side. Cook 1 minute then flip, 1 minute then flip 1 more minute and flip, then cook for another minute and shrimp should be done. If not all the way done move over to the cold side of the grill and let them sit for a few minutes or until done. Brush on the Baja Butter and plate! Serve with what ever you want. We made some for a side for our Tri Tip Sliders. Put all ingredients in a small pot and heat on medium heat on the stove. Stirring until the butter is melted. Turn heat down to low. Brush on the shrimp and serve!